As a general rule, I am not a huge fan of diet dessert. In my mind, diet + dessert = fresh fruit. Simple math, really. But as we’ve discussed before, even a dieter needs a treat on occasion. And if you are going to treat yourself, there are better and worse ways to do it. Last year, my editor for my magazine column asked me to come up with some diet desserts for the magazine’s annual diet issue. Naturally, I published a healthy muffin recipe. (You all know how much I love coming up with those!) And I came up with my amazing oatmeal protein cookies. And the third dessert, I figured, would be a crumble. Lots of fruit, oatmeal topping, it seemed like the natural choice for a healthier dessert. But I ran into a problem. Without sugar to break down the fruit, it simply wouldn’t cook fast enough to be ready at the same time as the crumble. Enter a clever solution, courtesy of my mom. She makes this fabulous and healthy dessert which is basically comprised of fruit, baked for a while until it is soft, sweet and delicious. I realized that by using that as a base for my crumble, I could make it sans sugar and still soft! The results were everything I hoped for and more. These crumbles are delicious in a way that makes sure you don’t miss the sugar. Or the white flour. Or the excess fat. So make them, and feel good about yourself! Combine the apples, berries and cinnamon in a large bowl. Toss to coat the cinnamon evenly. Bake in a large pan for 30-40 minutes, until soft. Spoon into ramekins. Spoon the crumble mixture over the fruit in the ramekins. Bake at 350 for an additional 20 minutes. *Note about the sweetener – use which ever dry sweetener you like and consider healthiest. You can use sugar, stevia, splenda, xylitol, etc. Whichever you choose, make sure to use 3/4 cup worth. Looks delicious! I’ll take mine with sugar, please! The funniest thing happened. I made something very similar to this recipe for dessert tonight and then later I check my email and see your newest post. I was shrieking! I like the twist of adding strawberries in there. 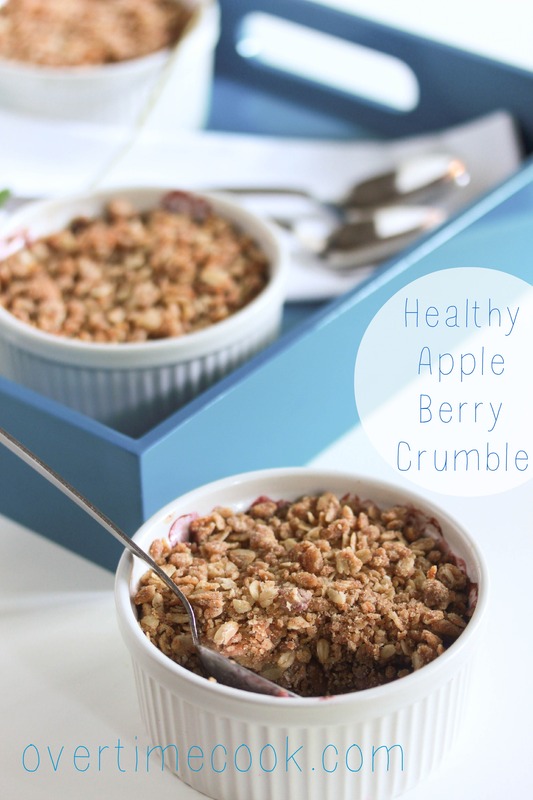 Your crumble looks so delish! since you published it in the ami last year ,i have made it many times and its delicious.. thank you! Thanks for letting me know! Appreciate the feedback! Oh I love that there are nuts in this crumble! Looks wonderful. Sorry, I am not so familiar with stevia baking…try it and let me know how it comes out! Just wondering — if I wanted to make this recipe using cupcake holders, how many would it yield? Can you double it? Alternately, what size baking pan would work instead (8″ square, 9″ round) and I could scoop it out to serve? what type of apples do you recommend to use for this recipe? Do i bake the apple mixture covered or uncovered?